Fiction – paperback; Phoenix; 162 pages; 1999. 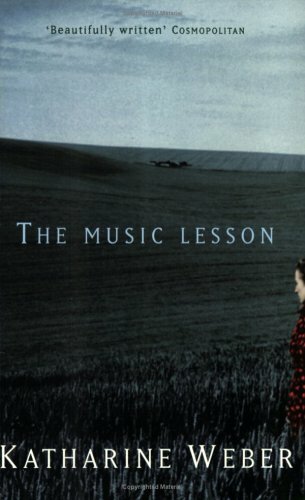 The Music Lesson is the second novel by American writer Katharine Weber, who, in 1996, was named one of the 50 Best Young American Novelists by Granta. She has since gone on to write two other critically acclaimed novels, the latest of which — Triangle — is on the long list for the International IMPAC Dublin Literary Award. Which is a roundabout way of saying, she’s got some kudos in the book world. At just 162 pages in length The Music Lesson is an almost perfectly formed — and quick to read — novel, which tells the story of Patricia Dolan’s unwitting involvement in an IRA splinter group known as the (completely fictional) Irish Republican Liberation Organisation (IRLO). But it’s also a story about 17th century Dutch art and the murky world of Irish-American identity. The narrator is a 41-year-old librarian who works at the Frick Collection, an art museum in New York. She’s lonely, bored and still grieving over the break-up of her marriage and the death of her daughter in a traffic accident. She’s close to her father, a retired policeman of Irish extraction, and has grown up with a notion of her Irishness, although she’s never set foot in her “homeland”. One day she receives a phone call from a man with an Irish accent introducing himself as her cousin, Michael O’Driscoll. Curious, because “he sounded young” and envisioning a “student with a knapsack, run away from university, seeking his fortune in America”, she promptly invites him for lunch. contemporary relations in Ireland. Which is really odd, now that I think about it, given all the passion about Irish politics in my family. It have had something to do with grandfather Paddy’s being so cut off from his parents only a short couple of generations out of Ireland. The meeting with Mickey changes Patricia’s life. She embarks on a sordid affair with him. And then, just weeks into the relationship, finds herself acting as a a kind of unpaid consultant to the IRLO theft of a valuable Vermeer painting, The Music Lesson, owned by Queen Elizabeth II. Told in diary form from Patricia’s perspective, The Music Room is not a straightforward narrative. It often loops back on itself and information is withheld from the reader, so that you’re never entirely sure whether Patricia is as calculating as her co-conspirators or whether she’s simply a naive pawn in their game. For the most part, it’s a gentle, lolling novel, perhaps mirroring the beauty of the rural countryside Patricia finds herself living in. There are lovely passages about art, especially Vermeer’s paintings, which convey a real passion for the subject matter. But there’s also a delicious undercurrent of potential terror and violence. When you begin to realise exactly what it is that Patricia has got herself caught up in you do, in fact, fear for her safety. Ultimately, The Music Lesson is a powerful read, a kind of bitter twisted love story gone wrong, which is written in a rich, evocative prose that absorbed me from the first page to the last. If this novel is any indication of Katharine Weber’s talents, then it’s time I tracked down her other work and got lost in those stories too. Katharine Weber came to our Book and Author Luncheon last June 2007. She was a wondeerful speaker and explained what she did in heer latest book Triangle. The Music Lesson introduced me to her and blew me away when I read it. Read Triangle you’ll love it!